this is another climbing spot located in the island, thanks to Krzys and Lisa for sharing the latest info below and photos. info updated as at 17 June 2013. At Juara, follow the road North to it's end where the river crosses the beach. Ford the river (at low tide it is maybe 1m deep, at high tide you may need to swim as it reaches 2+m's). Dry bags for your gear are recommended! There is no bridge. Cross to the base of the hill where there is a slight clearing in the jungle. 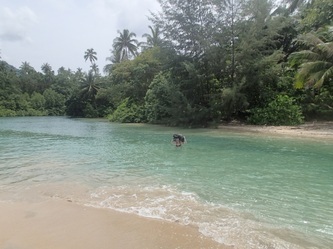 On the right hand side, 50m from the shore is a blue rope attached to a tree leading up to a steep trail that goes straight up. If you can't find it, just jungle-bash up! 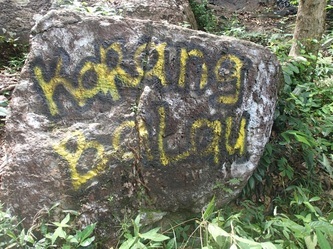 After 20 minutes you will reach the base of the cliff with a rock signed in yellow 'karang balau'. Type of climbing is slabby on pockets at the bottom, finishing on steep tufas. Rock is EXCELLENT, and all bolts look very recent and in good condition as of 2013. 10-15 routes, from 5+ to 6b? (harder on the left) up to 20m in length. 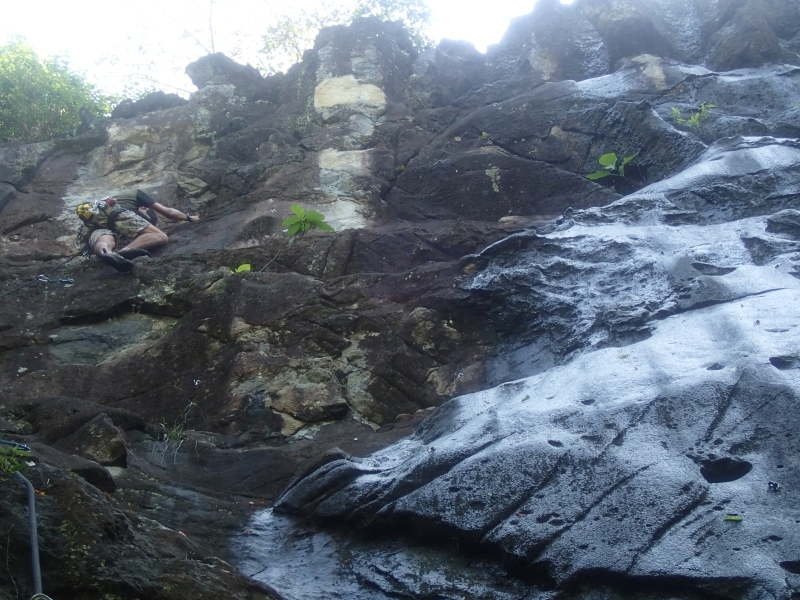 Rock seeps wet for a long time after rain so best to visit when it has been dry for a while but even then there are a couple of lines which can still be climbed up the middle as friction is great. Watch for a hornet nest in the jungle on the far right!! 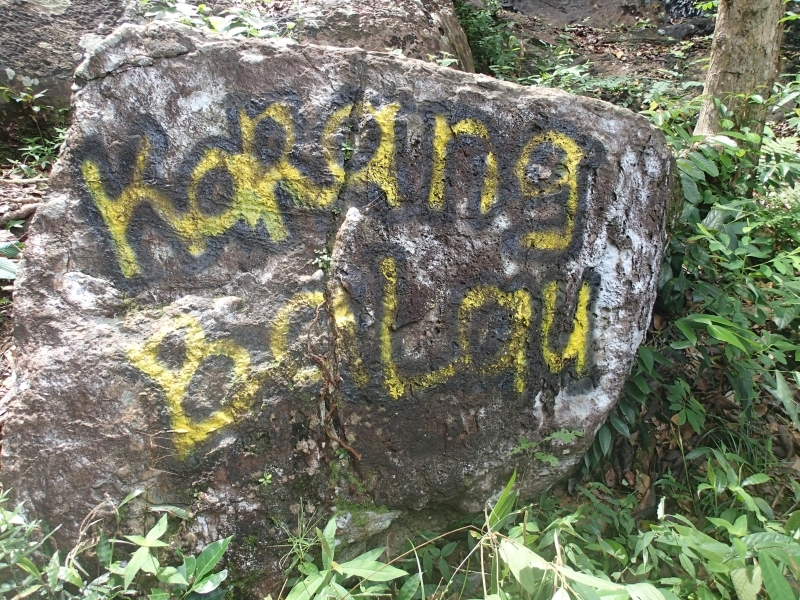 Follow the coast line (easier at low tide) for about one hour, boulder hoping and jungle bashing. There are sections were you will find signs (a yellow arrows and ropes to help). Eventually you will reach a set of obvious very steep overhanging rocks forming a cave. Easy down climb and scramble to reach them. Routes are all hard (7a upwards) and steep roof to start. Low bolts are in bad condition and rusted or need replacing, but lower offs are generally good. Be careful as not nice landings. Good view of Juara from here.